All rocks are made of 2 or more minerals, but minerals are not made of rocks. a sample or a specimen rather than a rock. There are about 3000 known minerals on earth. 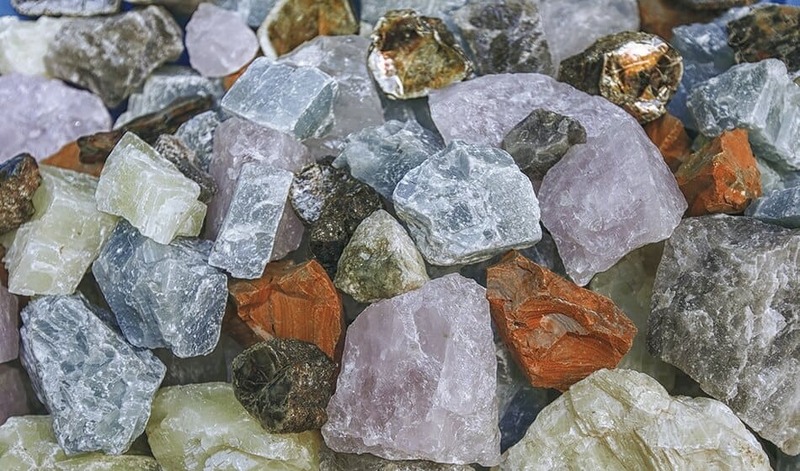 All rocks are made up of 2 or more of these minerals. For a good explanation of the difference between rocks & minerals, check out other related websites. Most rockhounds start out by just looking at rocks and getting to know them. But after a while, you’re going to want to know more. Simon & Schuster’s Guide to Rocks and Minerals (ISBN 0-671-24417-5), my personal favorite. Eyewitness Handbooks Rocks & Minerals (ISBN 0-7737-2575-X), a fabulous book for the beginning rockhound. Minerals by Class – Maintained by Amethyst Galleries Inc.
Minerals by Name – Maintained by Amethyst Galleries Inc.
rocks & minerals can also transmit light. Many rocks that are opaque when in a chunk, are translucent when cut into very thin slices. Gems stones are often valued on how clear, or transparent they are. Although most people think of color as an important characteristic of a specimen, it is not very useful in identifying a mineral. Specific Gravity (SG) indicates how many times more the mineral weighs compared to an equal amount of water (SG 1). So if you have a bucket of silver, it would weigh 10 times as much as a bucket of water. If you have a bucket of calcite, it would only weigh about 2 1/2 times as much as a bucket of water. That is why we think of metals as being “heavy”. They are heavy compared to other things that we are used to picking up. This is also known as the “heft” of an object. The average rock you would pick up has an SG of about 2.75. Because most of the earth’s crust is made up of quartz, calcite & feldspar. When something feels heavy, it feels heavier than expected for something of that size. How hefty a specimen feels has to do with how dense it is, its mass compared to its volume. super heavy 20+ must be platinum! Because of specific gravity, that means that 2 different gems that are the same size weigh different amounts. When minerals have the time & space to grow into their crystal forms, they grow to beautiful regular shapes that are easy to recognize once you have seen a few examples. Cleavage is when a mineral breaks with smooth flat surfaces. Cleavage can be described as perfect, good, imperfect, poor. Each mineral can scratch the minerals with lower hardness ratings. Each mineral can scratch itself. Don’t press hard, normal scratching should do. Corners or edges of crystals are softer. Small pieces seem softer than large pieces. Is it really a scratch or is it a powder line made from the tool you used because it was softer than the item you were trying to scratch? For a more detailed article about HARDNESS, click here. Habit – is it flat and scaly like mica or in a crystal form? Crystals of unusual size and shape are rare – they are in museums! Since there are some thirty variations of the crystal systems, few of us are qualified to judge. A poor field use, though some forms are useful e.g. quartz. Colour – useful in some cases but not reliable. Beware of oxidation or tarnish which hides the true colour. Also many minerals come in many hues e.g. quartz, calcite. Lustre – the way light is reflected from a mineral. Of very little field use. Opacity – or transparency. Metallic minerals are opaque. Some transparent ones may be potential gemstones. Beyond sorting out the metallics, this property is of limited use but don’t toss away any emerald, topaz, ruby or sapphire! Specific Gravity – or SG is of some use. Most metallics run about SG 3 to 4. “Stony” minerals are about 2 to 3. If it comes in over 6, stake a claim! Most dumps don’t offer specimens large enough to “heft” for us to judge. Use at least a good “thumbnail” size. Streak – press a piece across unglazed tile & note colour of powder. Very useful! Cuts through tarnish. Hardness – or H. Get to know Mohs scale! This is a very useful quality and usually the first test one makes. Keep that knife handy! While many minerals may be similar, this test is great for sorting out the two great stoney groups – calcite/limestone etc. and quartz. Hardness alone may at least put you on the right track. Good for metallics too – try pyrite vs. gold (6.5 vs. 2.5). Excellent first test but some minerals are harder in certain directions. E.g. kyanite; 4-5 lengthwise, 6-7 across the crystal. Cleavage – not the burlesque type but the way a piece breaks. Shell-like (conchoidal) yields sharp shards (as flint). Some yield smooth flat breaks (as micas) and some are partly smooth & rough in different directions (as feldspars). The quartz group – chert, flint, amethyst etc. – have very rough breaks. So do garnets. Of modest use but good for feldspars, quartz, micas, calcite, galena and halite for examples. Acid – use 10% HCl (hydrochloric or “plumbers” acid) in squeeze bottle. Excellent to verify the carbonates from almost anything else, especially the quartz family. Great for limestone vs. dolomite. Fizzes slowly on cold rock. Warm it up first. Oddballs – Taste – don’t lick everything – there is lots of arsenic around! Great for halite and potash salts if you suspect them. Oddballs – Magnetic – very useful for picking out magnetite, ground-up pyrrhotite (an iron sulfide). Use a horseshoe magnet suspended on a string. Oddballs – Fluorescence – of some use (in the dark) for fluorite, some calcite, scheelite and sphalerite .. Oh yes! And diamonds too! What is the time process to find out if your rock is a fossil & how much water in a container & what items do u need?